There's no denying that the story of modern art is chock full of iconoclasts, creators who disregarded the conventions of their times, left the rest of the world to catch up and became legends for their efforts, but while those kind of heavy hitters deserve the utmost respect for their paradigm-shifting contributions, there's also a danger in distilling history down to a handful of rock star-esque personalities. It's not so much disingenuous, there are bona fide visionaries, but it is kind of dully reductive, skipping over the messy, interesting context and getting right to the most colorful characters. 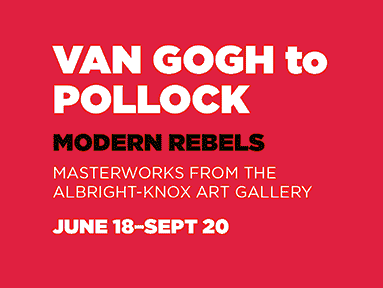 It's an approach seen throughout Van Gogh to Pollock: Modern Rebels, on view at the Milwaukee Art Museum until September 20th, which, while serving well as a sort of greatest hits compilation, feels similarly superficial. Drawn from the extensive collection held by Buffalo's Albright-Knox Art Gallery, the exhibit's 68 diverse works represent a who's who of modern art: Degas, Picasso, O'Keeffe, Lichtenstein, the list goes on and on. As such, there's no shortage of masterpieces on display here, but if the discrete entries, such as Joan Miró's busily surreal Carnival of Harlequin or Giacomo Balla's kinetic Dynamism of a Dog on a Leash, are stunning, there's precious little uniting them as a cohesive show other than the ill-defined rebelliousness of their makers. Sure, each of the artists included made the risky decision to break with tradition and discover their own unique voice, but simply having them share wall space doesn't bring the viewer much closer to understanding the common factor that allowed, or compelled, them to do so. Of course, defining that kind of genius would be a tall order, but that's precisely the point — the central concept is so broad as to be almost nonexistent, coming off less like an organic idea and more like an attempt to stuff as many famous names onto the poster as possible. Whatever its shortcomings though, Modern Rebels still brings together some spectacular work, mostly focused on painting but also making room for sculpture and a smattering of other media. Ultimately, getting to stand in front of something like Dali's The Transparent Simulacrum of the Feigned Image or Warhol's 100 Cans, even alongside those treating them as just another smart-phone photo op, is certainly worth the nominal price of admission, but the curators could've fashioned a far more compelling whole out of such iconic pieces.